Diamond Details: Princess cut white diamonds, channel set, of G-H color, VS clarity, with excellent cut and brilliance, weighing .55 carat total. Setting Details: Ritani Classic collection platinum design and accommodates a 1.00 carat round cut center stone. Measurements: Size 5.75 (sizable). Some sizes may be special ordered and take approx 3-4 weeks to deliver. This beautiful Ritani platinum engagement ring setting, from the Classic collection, features a royal crown under gallery with princess cut white diamonds, channel set in shank, of G-H color, VS clarity, with excellent cut and brilliance, weighing .55 carat total. 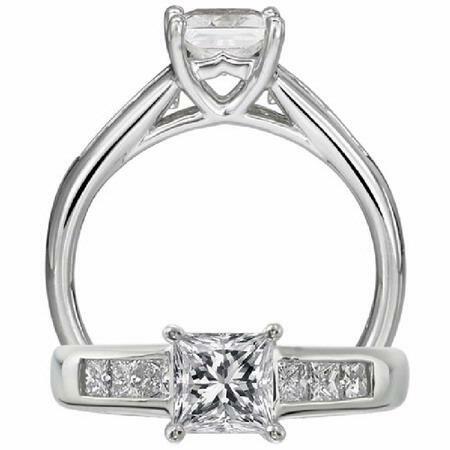 This ring is a size 5.75 and accommodates a 1.00 carat round cut diamond center stone. Ritani rings can be ordered in any finger size. Please allow 3-4 weeks for delivery. Ritani rings can be ordered in any finger size. There is a 10% surcharge for ring sizes 8 and over. Please call for pricing 1-800-790-6980 or 1-212-302-2863.